Many years ago, arthropods were one of my greatest childhood fears. I was so petrified of bugs that I hardly ever went outside during the summer. Anyone who knew me as a child would never have guessed that I would someday develop a passion for entomology and a love for the insect world. I began to collect insects in little plastic jars, but my rudimentary “collection” might as well have been a dermestid buffet; this was long before I understood how to properly store, curate, and preserve specimens. It wasn’t until my final year of high school that I realized that I could become an “entomologist” as a profession, a life-changing revelation. During the summer of 2016, I finally learned how to make a proper insect collection at the Ohio State University’s Stone Lab, where I enrolled in a week-long course on insect field biology. That autumn I started my first semester at Ohio State as an entomology major, commuting every day from my home in Westerville, Ohio. I recently completed my first year in the entomology undergraduate program, and I couldn’t be more excited about my academic future. I have met so many great peers and faculty members within the entomology department, and I have had the chance to explore entomology in ways that my younger self could never have imagined. I joined my general entomology class on an all-day collecting trip in Hocking Hills. I visited the on-campus insectary and learned about rearing insects with Chrysalis Entomology Club. But perhaps the most enlightening experience I have had so far was my interaction with the Triplehorn Insect Collection. I participated in an internship at the collection during autumn semester, then continued to work there part-time during spring semester. This summer I plan to continue working at the collection, but now the collection has presented me with yet another exciting opportunity: working on my first undergraduate research project. I will work with Dr. Norman Johnson and Dr. Luciana Musetti over the summer to research wasps belonging to the genus Pelecinus. 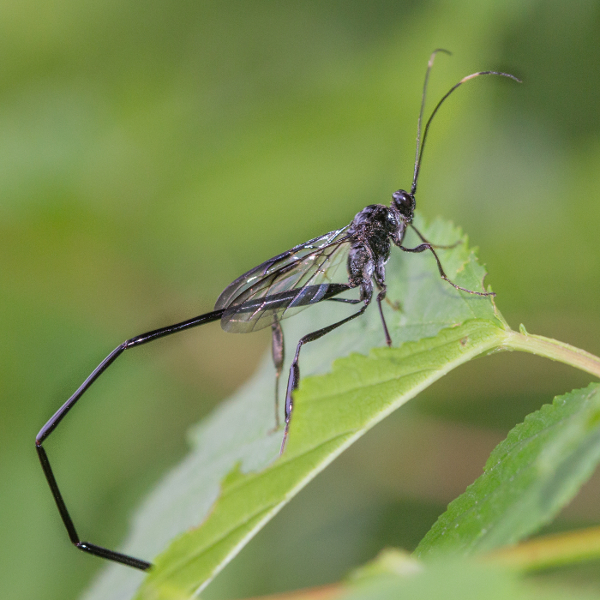 These beautiful insects may appear intimidating with their long, slender abdomens, but they are not aggressive toward humans and stings inflicted by their small ovipositors are rare. 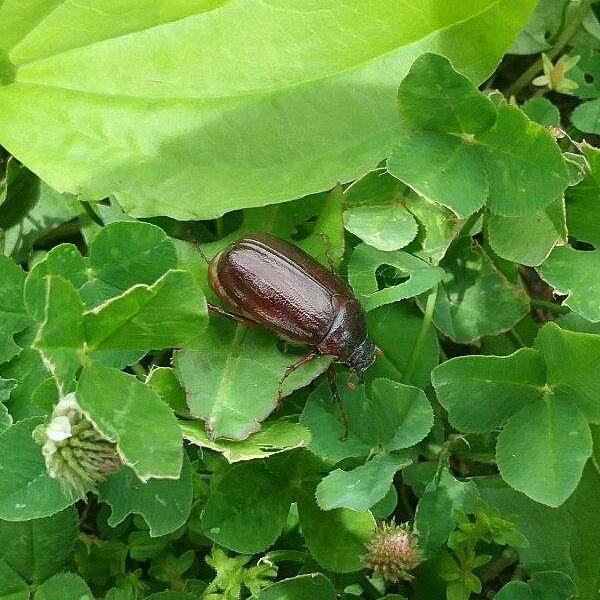 Their flexible abdomens are instead used to parasitize the larvae of Phyllophaga beetles, more commonly known as “June bugs”. The female wasp does this by thrusting its abdomen into the ground and ovipositing into the subterranean grubs. My research will focus on Pelecinus polyturator, a species that can be found in areas of South America and in North America east of the Rocky Mountains, including here in central Ohio. One of the most interesting aspects of P. polyturator is that males are extremely uncommon north of Mexico but become much more common further south. The goal of my research is to examine P. polyturator specimens from both northern localities and southern localities and determine if they are one species or if they are actually multiple distinct species. This can be determined using nondestructive DNA extraction and barcoding, which consists of using a species-specific genetic marker in a specimen’s DNA for species identification. I do not have any prior experience with DNA barcoding, or even molecular genetics in general, so I see this as an incredible opportunity to learn new skills that will benefit me throughout my entire scientific career. I will also get to learn first-hand how specimens such as Pelecinus wasps end up in an insect collection by going through the complete collecting process, from malaise trapping all the way to entering specimen data in the collection’s online Hymenoptera database. At the conclusion of this research project, I plan to present my findings at both the Denman and the CFAES Undergraduate Research Forums. One of my main hopes for this project is that it can be used to illustrate the research experience for other students interested in undergraduate research, both entomological and otherwise. As I continue to learn more about topics such as DNA barcoding, specimen collection, and Pelecinus wasps themselves, I will update this blog so that everyone reading can learn alongside me and watch the progress of my research in real-time. Keep watch for another post from me next week about taking photographs of P. polyturator specimens currently owned by the collection. I can hardly wait to share these images and the photography process behind them. About the Author: Hannah McKenzie is an undergraduate entomology major at the Ohio State University. She currently works at the Triplehorn Insect Collection and is participating in undergraduate research on Pelecinus wasps.